Latest Philips EPIQ 5 and 7-more compact and “greener” medical devices of Premium class in the contemporary medical equipment market have been added to the range of HC4 Ultrasonography (USG) devices. 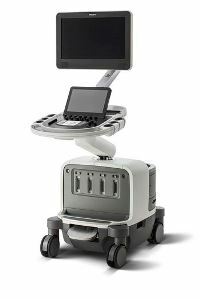 Philips EPIQ ultrasonographers has high resolution system provided for the usage in general imaging, invasive radiology, cardiology, study of vascular system, treatments and analysis used in obstetrics and gynaecology. Besides technology includes an elastography examination system that allows to define character of the formation more precisely, as well as to evaluate density of the tissues. With the help of this method it is possible to differentiate malignant and benign formations, thus potentially reducing frequency of unnecessary biopsy. Quantitative elastography for breasts, thyroid gland and liver acts are like virtual biopsy. USG equipment of the latest generation allows performing very precise examinations of veins and arteries to acquire objective data. Two types of probes are used - A/S 12 for examination of deep veins and A/S 18 for examination of thin veins and determination of their physiological functions. Philips EPIQ 7 is equipped also with 3D/4D imaging for the in-depth examination of the foetus. This technology is very important in obstetrics, especially, for the screenings made during 1st trimester, early pregnancy stage. As during this period of time foetus is only few centimetres long, whereas mandatory measurement of the crease of back of the neck is only few millimetres long and heart of the foetus during this time is only size of the rice grain, it is required to have examinations made with the highest quality device providing best possible resolution. Latest high frequency abdominal probe provides imaging of the highest quality even till 9MHz for visualisation of the smallest anatomical structures. As EPIQ 5 and 7 equipments are very easy to use, they significantly facilitate work of the specialists allowing using the time scheduled for the performance of examination more effectively. Ultrasonographers EPIQ 5 and 7 are equipped with automatic software for the improvement of the speed of work – automatic adjustment of the blood flow, as well as automatic measurements and visualisation of the standard views of the heart of foetus. Touch- screen technology allows doctors diagnosing in comfortable, fast and most significantly – precise - manner.